It's time for another Color Throwdown! Broni is our hostess this week with a fun, fresh color mix--turquoise, lime green, yellow, and white. I paired the colors with a loose interpretation of the current sketch at CAS(e) this Sketch. I represented the layout's horizontal panel with a shimmery white die cut stitched cloud placed across a turquoise panel. 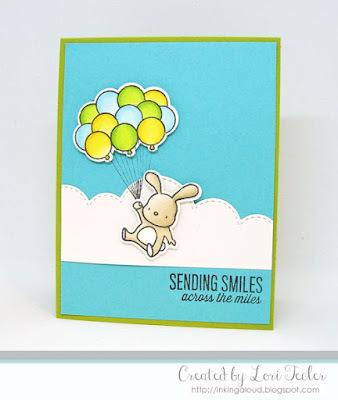 For the layout's vertical panel, I positioned the bunny with a turquoise, yellow, and lime green balloon bouquet from Mama Elephant's Up and Away set over the left side of the cloud strip, using foam tape for dimension. Too cute! The set's "sending smiles across the miles" sentiment was stamped just beneath the cloud strip. The finished panel was adhered to a coordinating lime green card base. To play along, just create a paper crafted project using these colors as a starting point and add a direct link to your finished project using the linky tool found at the end of this week's CTD post. As always, if you don’t have exact color matches, something close works just fine. Just be sure that the challenge colors are the dominant ones in your project. And, if you upload your project to an online gallery, use the keyword CTD443. If you upload your projects on social media, go ahead and use the hashtag #ctd443 and #colorthrowdown. You can find us on Instagram (and on Facebook!) with the username colorthrowdown. 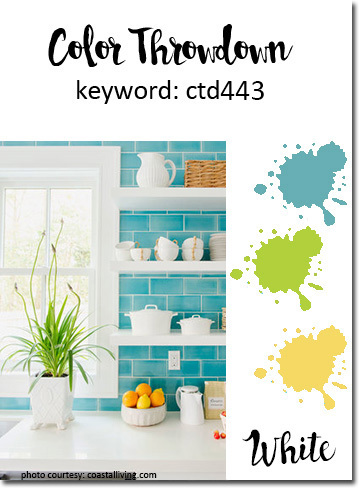 Before you get started, here’s some inspiration from the talented Color Throwdown team and our May guestie Amy Tsuruta. Super sweet take on the sketch, Lori!